This post is an entry in Paper Artsy's Challenge - Alcohol Inks & Pens. I don't have any purchased alcohol inks and have had limited success making my own. I had a look through the posts on PA's blog and as usual there were plenty to inspire. I really liked they idea of Dounia Larges's upcycled plastic as this is a media I have tried to use for projects before. I also like the flowers made from cans by Gail on the challenge original blog post. But then suddenly it was Sunday and I hadn't created anything and I still live in hope of being able to order something exciting from PA. So I found myself (easily) distracted from the work I should have been doing to create this simple page. The background I had already made with an acrylic and alcohol effect so thought this was at least close to what the challenge was. 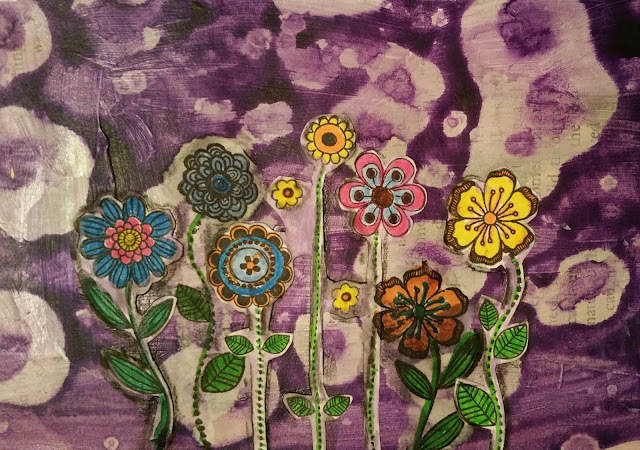 I then stamped the flowers (Bo Bunny Stamps) and coloured with Pitt Artist brush pens.